Eibach's Pro Plus kit is actually two of their other kits mashed together to form one super kit (Like Voltron but with car parts) that will enhance the performance of your vehicle noticeably. 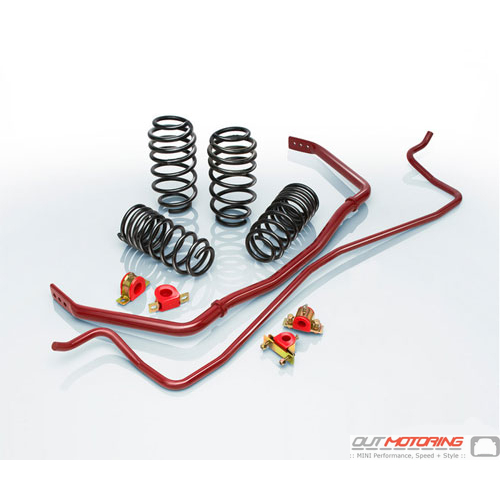 The first half is Eibach's PRO-KIT which is a set of performance lowering springs. Lowering Springs precisely lower your MINI's center of gravity, reducing squat during acceleration, body roll in corners, and excessive nose-dive under braking. Eibach's PRO-KIT Lowering Springs also reduces excessive fender-well clearance (Wheel Gap), making your car look just as hot as it performs. All Eibach PRO-KIT Lowering Springs are designed and tested by Eibach's suspension engineers and performance driving professionals to deliver aggressive, good looks and high performance handling, without ever compromising safety or ride quality. By using proprietary, progressive spring design, PRO-KIT Performance Springs provide the ultimate balance to take your passion for driving to a whole new level. The second half of the kit is Eibach's Anti Roll Sway Bar Kit, which comes with a 20mm 2-way adjustable swaybar and 26mm front swaybar and is a worthy edition to any car that is going to be turning fast. You'll get better control, more tire contact with the road, greater feel for the road in mid to high speed turns, and an overall more neutral handling car. Plus they're powder-coated in red, everyone knows that red make your car go faster. The combination of these two kits will deliver a new standard of performance to your Mini. If you just want one kit or the other, both kits are also sold separately on our website. Although I am not ordering any parts on this visit just yet, I wanted to thank you guys for such an honest and awesome company. My best friend just ordered her NM Exhaust from you today, and she had nothing but praises for your customer service and product availability. You are definitely going to be our number one source for parts.